SKU: BW-01. Category: Non-Adhesive Heat Pad. Tag: 5 Pads in a box. 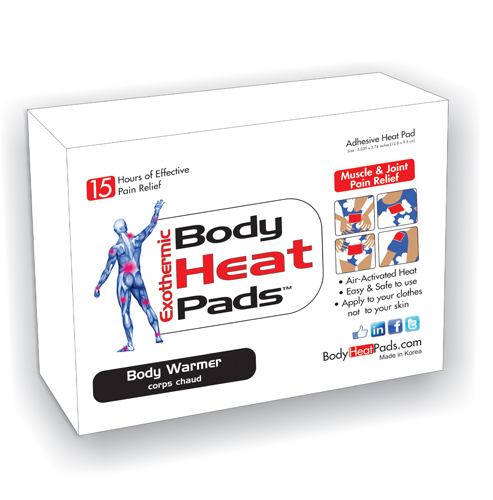 Body Heat Pads Body Warmer prevents blood vessel shrinkage caused by cold temperatures, by rising the temperature of the body. This allows the body’s blood vessels to expand and blood circulates better throughout the body. The Body Heat Pads also enables you to live a life more enjoyable simply by applying it at any time. After opening the plastic bag of the product, remove the sticker on the back of the heat pack and attach the pack onto an underwear or the inside of a coat. In particular, if the heat pack is attached to the lower part of the belly, waist or shoulder, the entire body will be covered with the warmth coming from the heat pad by the circulation of the blood.